By Elaine, Director of Recreation. Many of our staff have recently been inspired by the book Being Mortal by Atul Gawande. The chapter that sparked Recreation’s interest was “A Better Life”. It states that the three plagues facing people in their aging years are boredom, loneliness and helplessness. The book states opportunities to be creative and nurture as part of the solution. After reading this, we had a Red River Recreation student do a survey of residents on what would make for a better life at Lindenwood Manor. The results indicated they would like a space to do art, followed by interest in an area for gardening and planting. We discovered there was money sitting dormant in a fund from a garage sale many years ago! We were offered the money to cover the cost of setting up an art studio. I also put out a notice in the newsletter seeking donations of craft supplies. Wonderful supplies started arriving by the car load. Within a few days and a few shorter nights, the ideas and furniture came together. I imagined I could switch this cupboard with that one in this lounge and it would fit into the space we had in mind. The Terrace offered some extra furniture that they were not using and so it came to be. One of our residents, a former designer, commented that he could not have planned the room any better. That was quite the affirmation. The next task was picking a paint colour; this colour needed to evoke creativity. I read several articles on choosing colours for an art studio. We finally settled on a colour on the computer that promised to enhance creativity and that we thought would blend with the area around it. When we held the paint swatch up to the picture on my screen, the colour that matched best was called “Potter’s Clay”. That sealed the decision pretty quickly. We moved in, labelled the cupboards filled with supplies and we wondered, “Who will come?” Our first few events brought in such a variety of residents. It was working! Some who were very shy and withdrawn, and who attended very few other programs, participated and left with big smiles on their faces. Staff doing respite find this to be a quiet spot to spend time with residents and to practice art techniques. When I recently walked by the studio I saw a lady struggling with her memory, creating a beautiful Christmas card for her husband, who care gives for her and will soon be moving her to a Personal Care home. It was so emotional watching her shaking hand write a note inside to him. This place is an outlet for all who speak the language of creativity. A resident told me she stops by every day, just to be in the room. She finds it so calm and peaceful. A few weeks after we opened the studio, I had a call from the Alzheimer’s Society, asking if CTV could come and interview our colouring group members. TV already, yikes! With a bit of fear, I agreed, thinking, “Let’s show-case the beautiful things that are happening and the gift of this space we are enjoying”. The clip was aired several times at prime time and I had encouraging responses from across the country. Stories flowed of how colouring has helped them, including forming new friendships, reminiscing and finding it helpful when they can’t sleep at night. At Thanksgiving, the art class learned how to draw pumpkins. One of the residents decided to make lovely cards using her new technique. Within a few days, she had a resident contracting her to make cards for all of his family members. The money she earned from selling the cards was donated back to the art studio. 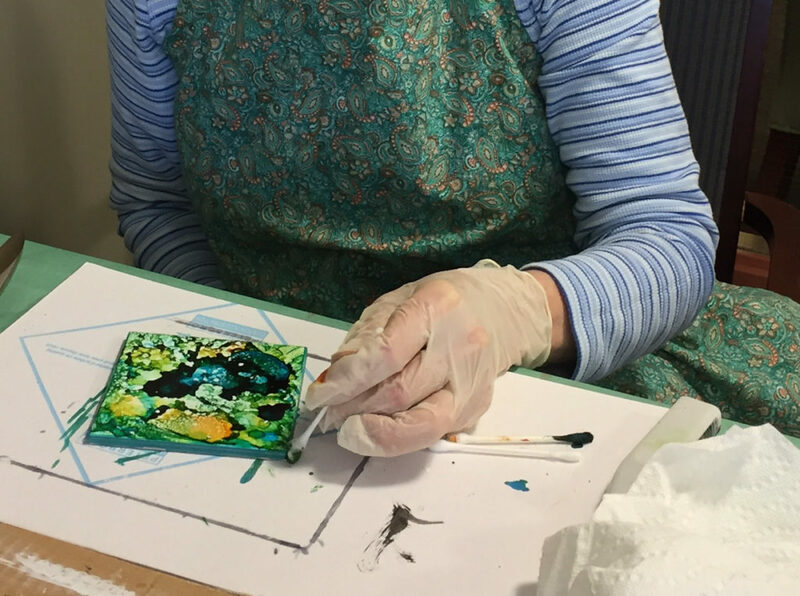 We are blessed to have high school art students running a drop-in class, staff who teach crafts, friends who share their talent, and professional instructors who have experience in working with seniors groups – all people who are taking on the dream of making a better life for our residents through art. Take a risk and don’t give up on a dream. Check out the CTV News segment here!